Dr D Digs Up Ancestors: What's your longest Single Shared Segment? What is the longest Single Shared Segment (SSS or should we call it S-cube) you match with a genetic cousin? By this i mean the DNA test report says you only share this one segment with the match. There are no genetic crumbs of additional and smaller matches that the lab can identify that you also have in common with that individual. Usually if you share a 30 cM or 40 cM or 50 cM segment with another relative, the two of you also will share additional smaller segments as well. However, that does not always seem to be the case. It is often difficult to find the actual familial relationship that connects to my tree such potential "cousins" with whom I share only one long matching segment. I have been analyzing a new match who MyHeritage predicts to be my third to fifth cousin. We are reported to share 53.6 cM. This would place us well within the expected range for such cousins. However, this match occurs totally within a single segment. In addition, my daughter, son and two of my three grandsons also share almost all this triangulated match. My new match is represented by the rose colored bar on my chromosome 12 below. The additional bars just below her in the triangulation box represent my immediate family members. Triangulated segments are shared DNA segments that you (or a person whose DNA kit you manage) and all of the selected DNA Matches share with each other, and therefore likely all inherited from a common ancestor. So far I have not been successful in connecting this new "cousin" to my family tree although I have done better with some shorter segments in this region of this chromosome as will be seen in the following example. There are sub-sets of the above group that are identifiable among my matches. One of them in this part of my genome I call my Valley Forge Segment. It is about 31 cM in length. I gave it this name because I inherited it from one and/or the other of my 4th great-grandparents, John and Hannah (Pearson) Hoar who were both adolescents in that area of Pennsylvania when General Washington encamped there during the American Revolution. It is normally difficult to trace with certainty atDNA this far back. However, in this case I have been fortunate. The couple who head the above chart are my 4th great-grandparents. 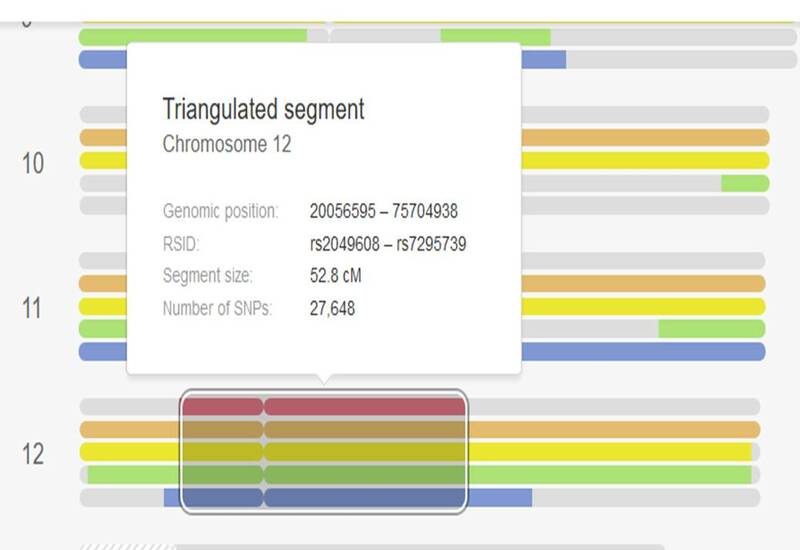 The rose colored boxes represent their descendants who have been shown to triangulate on the same 31 cM of atDNA on my chromosome 12. The gold colored boxes represent other family members who have triangulated on major chunks of this 31 cM. My two grandsons who inherited this DNA are in the lower right of the chart. Since they are now 11 and 8, it is likely this 31 cM segment will survive intact in them and/or their descendants until at least the Tricentennial in 2076. Quite a family heritage. The above digression demonstrates that part of the original triangulated fifty plus cM match with my new cousin has been intact for well over two hundred years. I am beginning to try to connect some of the smaller triangulated matches that overlap my original Single Shared Segment (red bar below) with which I began this post. The red bar in the top line of this chart represents my new cousin with whom I have a 53 cM overlap. The gold bar on the second line represents the 31 cM "Valley Forge" segment shown above. The yellow, green and light blue bars represent other recently discover cousins who MyHeritage reports as triangulating with the red bar. The yellow bar also has a small triangulation with the "Valley Forge" cluster. The darker blue bar represents a known paternal first cousin of mine whose account I manage. Her larger segment in this chart triangulates with both the red bar and the ''Valley Forge" bar but not the other bars. What seems to be emerging are at least two distinct subsets of triangulated groups both of which triangulate independently with my 53 cM Single Shared Segment. 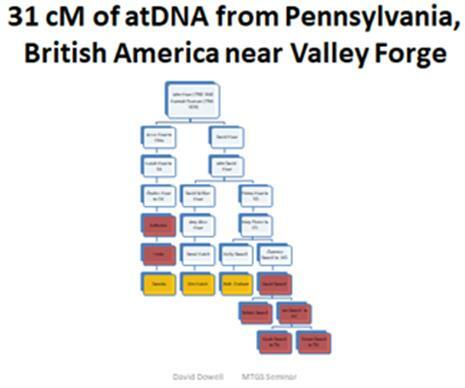 I have already identified how some of those within of the 31 cM Valley Forge Segment relate to me. At this time I have few clues as to how those in the other subset, to the left of the Valley Forge Segment (gold bar above). actually relate to me. I am most curious as to how I relate to my overarching 53 cM Single Shared Segment who would appear to unify these two subsets. I have just made contact with my 53 cM match and so far we have discovered no obvious connection but we will continue to look. It appears obvious that she is on my dad's side of the family but we have not narrowed it down much further. She is probably down the part of my paternal line somewhere near the relatives who make up my Valley Forge Segment cluster. But then? As I was writing this post I realized I have several even longer Single Shared Segments (SSS). One is almost 75 cM in length. Is there something unusual about how these segments appear to survive as they pass down through the generations leaving no other genomic dust in their wake? Other individuals with whom I share chunks of 30 cM or more tend to share a number of additional segments -- some as many as 20 or 30. This seems to make them easier to fit into my known tree. Of course as the cM total climbs, so does the likelihood that the person is a closer relative. Have you had experience, either good or frustrating with these SSS matches? Are you willing to share what you have learned? Dr. D. would love to hear from you. I have decided to identify others with whom I have SSSs and separate them out for special attention. You can get in on the fun. It's easy if you have test results at MyHeritage but I'm sure there are workarounds at other sites. When you are logged in to a MyHeritage account, select the DNA tab at the top of the screen. Then select the Chromosome Browser option from the drop-down menu. Your first 20 matches will be displayed and it will be easy to see how many segments you share with each and the length of your longest matching segment. By the second or third page of matches you should start seeing your longer Single Shared Segments. Have fun and don't forget to write about your discoveries!